As the General Manager of the Dell EMC VMAX business unit, I interact with a variety of customers on a daily basis. It is very clear to me that today’s IT practitioners are increasingly relying on All-Flash storage to consolidate their ever-increasing, performance-hungry workloads amid the explosive growth of data. Given the adoption rate, we expect that over half of all data centers will use only All-Flash arrays for primary data storage within the next three to five years. While there are many All-Flash solutions out there in the market, clearly all are not created equal! We have architected Dell EMC VMAX All Flash arrays to solve the CIO challenge of embracing a modernized flash-centric datacenter for mission-critical applications while simultaneously simplifying, automating, and consolidating IT operations. VMAX All Flash combines the best of new high-density flash technologies with a proven set of rich data services required to build a modern data center. Simultaneously, it continues to deliver the reliability and mission-critical availability that VMAX customers have relied on for more than two decades. Earlier this month, we sat down with 12 independent storage industry experts at a Storage Field Day event and discussed the core architectural tenets of VMAX All Flash that are helping 94% of Fortune 50 companies, 18 out of 20 top banks, 9 out of 10 top life insurance companies and thousands of other customers to manage data growth, reduce data center sprawl, deliver extreme performance and availability while meeting their business SLAs day in and day out. Needless to say, they were impressed! 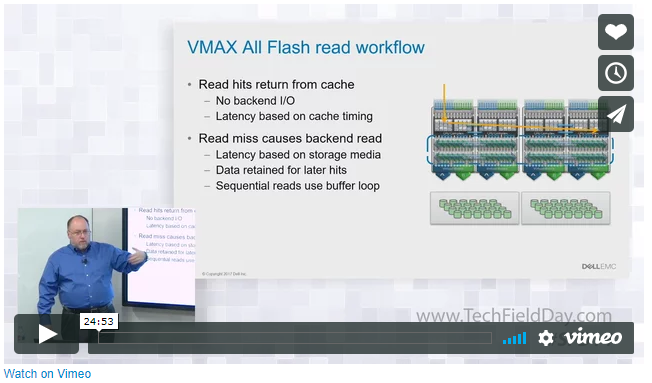 Check out the entire set of VMAX All Flash video recordings at the Storage Field Day 14 site. 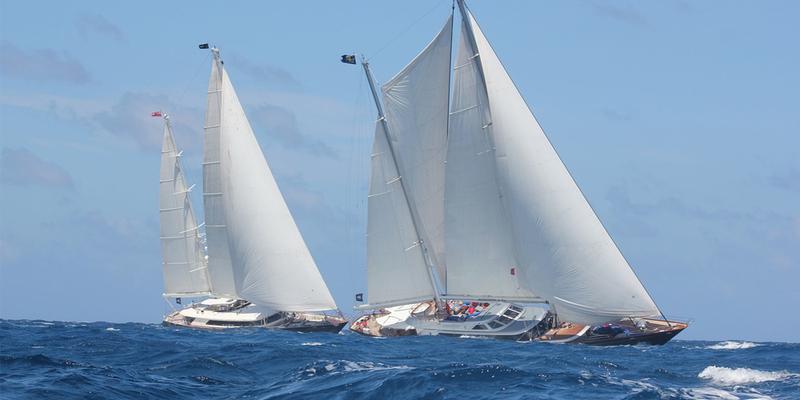 And we are not afraid of going head-to-head against our competition in a public setting! Recently, Principled Technologies evaluated VMAX 250F All Flash and HPE 3PAR 8450 side-by-side with an eye towards how these arrays can handle mixed workloads in a modern data center as well as deliver business continuity in the event of an interruption. Both the arrays were configured with the same number of controllers and similar number of disks/capacity to make it an apples-to-apples comparison. The tests started with performance testing for Oracle Database 12c transactional workloads. Next, a data mart workload was added to determine how the arrays handle this mixed workload. Data marts are a convenient way to move chunks of data from multiple departments to one centralized location that’s easy to access. Businesses rely on the smooth flow of data mart information for reporting, analysis, trending, presentations, and database backups. Ability to consolidate transactional workloads as well as data warehouse sequential workloads on the same platform is a cornerstone of an All-Flash array to serve as the core primary storage platform in today’s data centers. Principled Technologies determined that the VMAX 250F handled 39.5% more IOPS on average than the 3PAR 8450 during the data mart load. The VMAX solution handled both reads and writes much faster than the 3PAR solution during the data mart load – up to 145% faster reads and 1,973% faster writes than the HPE solution! The 3PAR 8450 storage array experienced lengthy delays when processing reads and writes at the same time with the added data mart load – read latency increased 129% while write latency increased 2,133%! So what does this mean for you? With the VMAX 250F, you can run your production workloads while always meeting your SLAs and never worry about whether adding an analytics workload, compiling large amounts of data from multiple sources, or performing an extensive backup would affect the performance. With 3PAR 8450, it’s not the same story – long wait times on accessing data when you run mixed workloads will surely frustrate your users and hamper your business. The second phase of Principled Technologies’ comparison of the Dell EMC and HPE 3PAR All-Flash storage involved remote replication and disaster recovery. For the Dell EMC solution, they used Unisphere for VMAX to set up two VMAX 250F arrays with active-active SRDF/Metro remote replication. For the HPE 3PAR solution, they set up one 3PAR 8450 array and one 3PAR 8400 array with Remote Copy and Peer Persistence (which is only available as active-passive at the LUN level) enabled. When Principled Technologies initiated a lost host connection to both the local arrays, the entire workload on the VMAX 250F solution continued to run with no downtime following the outage and all I/O shifting immediately to the remote VMAX 250F. In contrast, the application workload on the 3PAR solution needed to transfer 100% of the I/O to the secondary (passive) site and stopped until they restarted the VM. SRDF/Metro is a true active-active solution, which ensured consistent data access during their site failure. HPE’s Peer Persistence is active-passive at the LUN level. So, during their local storage failure simulation, all the paths were inaccessible until the standby paths to the remote array became active or they restored the connection to the local system and failback occurred. This means the difference between having consistent data access during a site failure or not. Check out all the details of the Principled Technologies testing and their findings. In the end, Principled Technologies discerned that Dell EMC VMAX 250F All Flash storage array lived up to its promises better than the HPE 3PAR 8450 storage array did. We are not surprised – thousands of customers reach the same conclusion day in and day out not only when compared against HPE 3PAR but also against all of our All-Flash enterprise storage competition! Learn more about VMAX All Flash.